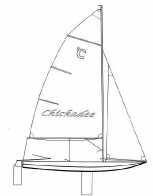 The Scow is a design form for sailing dinghies which stands for extreme width at a low freeboard height. 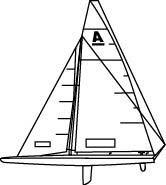 Besides the low freeboard the wide bow form represents the clearest feature of the Scows and is obviously different from the pointed prow of other sailing dinghies. 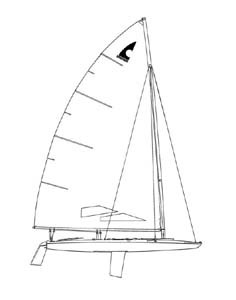 On sailing you have to pay attention, that the scow sails fastest with a heel of 20° to 30° (by a strong reduction of the covered hull surface and good blading of the waves), while conventional sailing dinghies shall just be trimmed as upright as possible. The noticeable scow shape causes on us the impression of a new, fast design form, possibly the outcome of elaborate computerized flow simulations, but to our surprise the design founds in the mother country of the scows, to the midwest of the United States, on realizations of the 19th century. So in 1800, one could already face numerous Scow schooners in the coastal waters of North America, distinguished by her low depth. 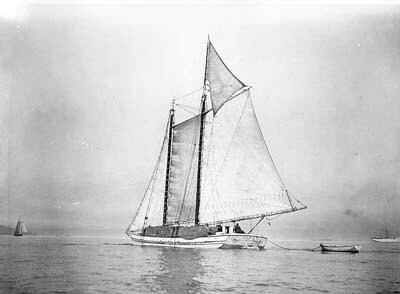 In the area around the Great Lakes of the United States and Canada big scow jolly boats (6 to 7 meters of length) were already built at about 1890 because one had realized in regattas that they were faster than conventional boats. On August 24, 1897 10 yacht clubs of the region met in the club house of the White Bear Yacht Club and founded the Inland Lakes Yachting Association (ILYA). Although at first there were not any unity classes yet but classes were arranged according to a measurement formula and were therefore open to also other types, but the scows exclusively asserted themselves with the ILYA clubs. Today belong 47 clubs to the ILYA which are at home in the states of Wisconsin, Minnesota, Michigan and Illinois, with a few exceptions. 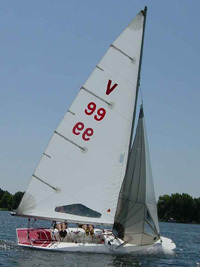 The most common scow worldwide is, however, the Fireball. The boat was designed by the Englishman Peter Milne as a self making design in 1962. The Fireball has a size which gets very close to the Tempo size, and has achieved the status of an international class of the IYRU (today: ISAF) in 1970, however, by her worldwide distribution, and at that time she was on her way to become an Olympic class. Few men start a new career at the age of 55. Even fewer are lucky enough to do for a living what was formerly a hobby. 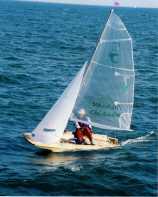 In 1966, Jack Köper, South African yachtsman, sailing dinghy designer and backyard boat builder did both - he left the printing trade in which he had worked all his life, and became a professional sailmaker. In his sail-loft at Paarden Eiland he had a stuff of six to cope with orders from as far as Canada and United States. 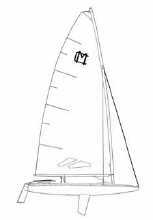 They range from sails for the little "Dabchick" which Köper designed himself, to sails measuring hunderts of square feet for ocean going keel yachts. Like many of his other activities, Köper's sailmaking self-taught - "through books and trial and error" - though before setting up as a professional, he went on a brief visit to England, Holland, Switzerland and Italy to study the latest methods. "A lot has been written about the science of sail shapes and wind forces and so on - but sailmaking is still a creative art." Jack Köper's first sailing experience occured when he was nine, on a river near his birthplace, Haarlem, in Holland. "My father took me out in his 12-ft dinghy, and I was dead scared. Water was coming over the bow and I thought we were going to capsize. I kept out of sailing boats for years afterwards." About ten years later, however, he joined a rowing club, but was forced to give up this form of exercise because of health reasons. "So at the age of 22 I started sailing agin. I bought myself a 12 square metre Sharpie and won the first race I ever sailed in, which was very encouraging. I didn't know the first thing about the rules." In 1936 Jack Köper came to South Africa, married a Dutch girl, and then returned to Europe at the outbrake of war and served with the Netherlands Government in London. 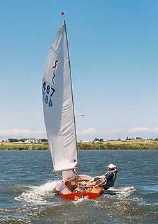 In 1947 the Sprog sailing dinghy made its appearance on South African vlies, and Jack was asked by a fiend to skipper a Sprog at Zeekoevlei. "We sailed quite successfully," he recalled modestly. What, in fact, happened was that he won the national yachting regatta at Knysna in 1950. 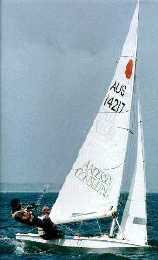 Shortly afterwards Köper, with an instinctive feeling for the best in sailing, was struck by a new design published in a Dutch yachting magazine to which he subscribed. With others he sensed that the 20 ft. Flying Dutchman - now regarded as the aristocrat of single-hulled sailing dinghies throughout the world - could become an international class. With the aid of another well-known yachting personality, Dr. Ken Warr, he arranged for the first batch of FD shells to be sent to South Africa, an order for five shells and one completed hull as a pattern for finishing the shells. An unconfirmed legend is that the completed hull in this batch was Van Essen's prototype Flying Dutchman, sent out to meet the South African order because it was the biggest received and the prototype was the only complete hull in existence. This internationally-historic hull is reputed to be still on the hard at Hermanus Yacht Club. His Family, two sons and two daughters showed great interest in their father's sail hobby. When Gerhard, the second oldest, was 14 he wanted his own boat. "So I decided to design one myself. It had to be safe, easy for a young boy to handle, simple and cheap to build, yet fast enough to plane and provide real excitement. The result was the Dabchick, which I designed in six months. Underwater, the hull was V-type, yet it was totally enclosed and no water could get in in the event of a capsize." "
The size of the boat was entirely dependent on the material I had to hand. The largest plywood sheets are made 8 ft by 4 ft So three sheets would cover a boat 12 ft by 4 ft which are the overall dimensions of the Dabchick." Ten years later, there were 2,100 Dabchicks, not only in South Africa but also in England, United States, Canada, Australia, New Zeeland and several African countries including Kenya and Nigeria. The Tempo followed in 1963. Köper said: I thought there was room for a third boat between the Sprog and the Flying Dutchman. The basic design would be that of a Dabchick, but it would be far more sophisticated. It was to be a boat with sufficient comfort for adults, but built for speed. To capture public imagination, it also had to look fast in appearance and be utterly different from any other class. My idea was to use four sheets of 8 ft by 4 ft plywood, limiting it to a maximum length of just under 16 ft. It would have a baem of 5 ft for stability and this involved carefully cutting of the plywood. 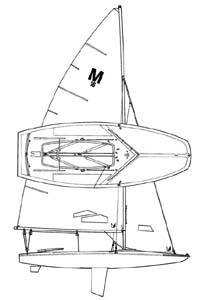 The boat would be norrower than 4 ft fore and aft and the off-cuts would be used for the wider mid-section." The Tempo took two years of design. After he had built it köper launched it secretly at Hermanus in 1963 and sailed it there for six months before officially letting anyone konw about the boat. "I then sailed it single-handed in an all-class race and was soon far ahead of everyone else. After these tests I found it necessary to make it a bit stronger. I also added buoyancy tanks to the sides of the cockpit - it already had fore and aft buoyancy. Plans for the Tempo have since been published in yachting magazines here and oversea. In Holland, where there are now about 150 Tempos, they are trying to make it an international class. Tempos are also being sailed in Germany, England, Italy and United States. at present 186 are registered in South Africa." The Tempo took two years to design. After he had built it Köper launched it secretly at Hermanus in 1963 and sailed it for six months before officially letting anyone know about the boat. "I then sailed it single-handed in an all-class race and was soon far ahead of anyone else. After these tests I found it necessary to make it a bit stronger. I also added buoyancy tanks to the sides of the cockpit - it already had fore and aft buoyancy." After there had been reports about the Tempo in sail magazines all around the world, it was distributed in South Africa, the Netherlands, Germany, England, Italy, and the United States. 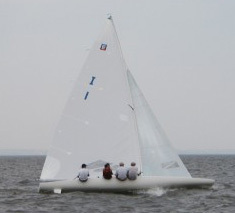 It is not surprising that when, in 1970 Jack Köper designed a third dinghy, the Sonnet. This time the design offered a smaller scow, drier than the Dabchick, with adaptibility to one or two-man sailing but - more imporant and almost revolutionary in South Afrrica - the Sonnet was rigidly "one design". 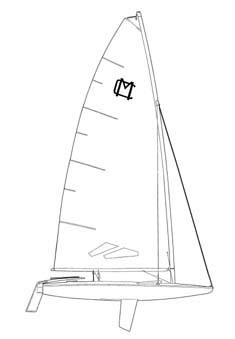 By an extra long centreboard case it is possible to sail the Sonnet with and without (single handed) fore sail and adjusting the centre of lateral resistance by altering the centreboard to the front or aft to the altered centre of pressure of the sails. The Sonnet is certainly a very successful class in South Africa today. I grew up in a prominent sailing family in South Africa. My father Jack was a National Champion sailor, and had helped introduce the Flying Dutchman to that country. Then he changed the sailing scene through his pioneering Dabchick design. He created boats with fantastic performance, faster on a reach than many larger boats. I was only 14 when I built my Dabchick, with sail number 7. The Dabchick class has issued some 3,500 sail numbers since 1956 and they are still being built. The Dabchick is still the definitive junior trainer in South Africa, the logical next step after graduating from the Optimist. Most of the well-known National and International sailors there learned to race on a Dabchick. They have been built in North America, Australia, and Europe. Over 500 Sonnets have been built. The niche was people who wanted to sail at a reasonable cost, yet attracted to her great performance in windy coastal areas. The Tempo numbered about 350-400, including fleets in Europe. 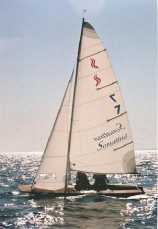 I inherited my Dad's capabilities in design, and have an extensive sailing background too. I was ranked 5th in the Canadian Finn Class and on the National Team and achieved 3rd in the J-24 Canadians. 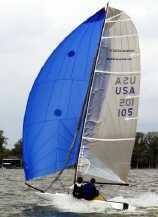 I race a Hobie 20, and have been the top boat within our Division for 5 successive years. I am Chairman of Hobie Cat's Division 16, and am Director of Drysailing at the Etobicoke Yacht Club. I love the light-weight scow concept because it combines the stability enjoyed by learners with the sparkling performance wanted by experts. 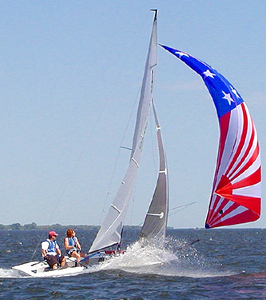 Lightweight scows are responsive and surprisingly fast, especially across the wind. The wide bow sections respond to each wave, giving a lively feeling to the boat. 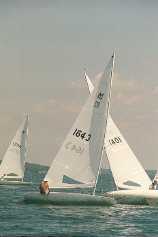 The amazing speed of sailboards is derived from this format. The V-bottom design enables you to heel the boat and reduce wetted surface drag, while still leaving a stable platform to sail on. It also makes them easy to build, as there is no complicated twisting of the plywood. The origin of Scows goes back many decades. They are still very popular in the Mid West USA, and are spreading south. The 18 ft Y-Flyer has been loved in Canada for a long time. This history is still having a positive impact in North America, but most of these boats are rather heavy. Designing lightweight scows has opened up a new direction. Home building is an opportunity to create something of lasting beauty - while achieving sailing on a safe but fine performing craft a whole lot more affordable! Like Jack's innovative designs, the Sonatina and Chickadee can be built at home - offering a very worthwhile creative experience, and cutting the cost in half. They offer a new way of learning about boats and achieving outstanding performance to sailing enthusiasts in North America and Europe. On the 8th November 2006 Chris Koper the master sailor, yacht designer and photographer extraordinaire, passed away in Ontario Canada. For the last two years, Chris had suffered with ALS (a form of motor neuron disease) which, since the middle of 2005 had advanced rapidly. In his last months, Chris was barely able to speak but still keeping in regular contact and directing people around him by means of special computer based aids that made it possible to type messages and even to use a computer based speech system that he controlled by moving his head and using a special clicker between his knees. Chris planned his last year and a half meticulously and lived it to the full. He faced his illness head on and never shied away from talking or writing about how it affected him both physically and emotionally. His writings about his own experience of "living with ALS" and invitations to people around him to write about how they related to him with ALS, led to many inspirational moments and written records. Although Chris left South Africa in 1969 to avoid the military draft (he was a conscientious objector, just like his father during World War 2), he always regarded this country as his spiritual home and visited here regularly, particularly in the last 10 years. His Canadian wife and he had planned to make this their second home upon retiring. In early December 2005 Chris and Margret came to live in Cape Town for 3 and a half months. During that time, there was a particularly special moment for Chris when he was invited, quite spontaneously, to speak at the prize giving of a junior regatta weekend at Imperial Yacht Club in Muizenberg (of course, his fathers Dabchick, was one of the classes racing ). It was one of those heart stopping moments that will be remembered by all who were there. Chris will be remembered for his Sea-K-design, yacht designs, C K Imagineering (a name he created himself for his first class collection of photographs) and his inspirational writings created during the time with ALS. All in all, the last 6 or 7 years represented a really creative highpoint in his life at many different levels. By a process of self discovery and some interesting tell tale "messages" from his late father Jack Koper, that Chris found in envelopes left specifically for him, Chris himself became a yacht designer in the late 90's. His first design used his fathers Sonnet as inspiration and template. By updating certain key aspects of the Sonnet, this evolved into a thoroughly modern new scow, the Sonatina. 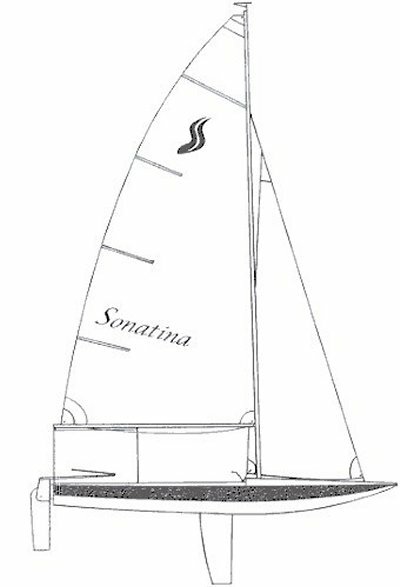 With bigger sail plan (one of the "messages" his father left him was, a note on a Sonnet plan that revised her sail dimensions to exactly the sail dimension that Chris had already calculated he would need for the Sonatina), enhanced underwater shape and different sail configuration possiblities, she could be used in a much wider range of wind conditions and skipper or skipper/crew combinations. For his second design Chris again turned to his father for inspiration using the Dabchick as the basis. Chris felt very strongly that in North America particularly, there was a gap for a boat between the Optimist and the club 420, much like the Dabchick has served for decades as the link between Optimist and other bigger boats here in South Africa. So, while again keeping the overall look and feel of the Dabchick, the Chickadee (like the Dabchick, the name is inspired by a type of bird) as she became known, has some key enhancements, most notably bigger rig, more volume in the front of the hull and the higher sides and dished cockpit creating a drier and more comfortable boat. Recently Chris has received various accolades from well known yachting individuals, with the highest accolade being, appointed as fellow of the LSSA, the oldest sailing association in Canada and a personal message of inspiration and congratulation for his designs, recently received from the Fogh family, a distinguished name in North American yachting circles. In dealing with ALS, Chris was not shy to let the yachting world know what he was facing, and even launched an appeal to "Keep the Dream Alive" on his Sea-K website and in personal interaction with people. 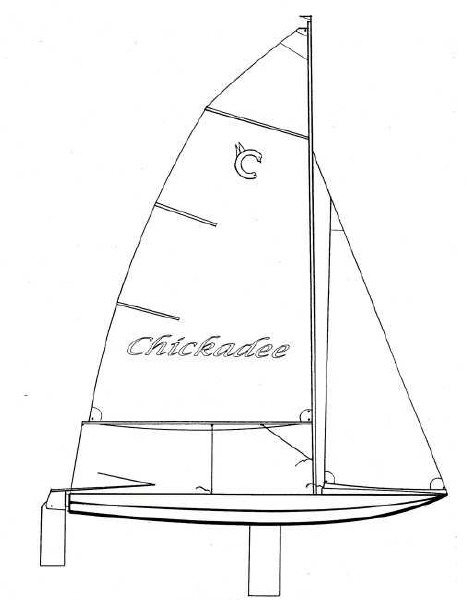 His Chickadee design will be used in an "at risk" youth group project, to both teach boat building and a sailing skills in Toronto. A similar appeal was launched here for a South African development project, some 2 months ago in this magazine. When his wife Margret put him to bed on his last night of consciousness, she was able to tell him that funds had been raised for the youth program to start building his beloved Chickadee. It was heartwarming to know that he fell asleep and into a peaceful state with a smile on his face and a twinkle in his eye, anticipating the legacy that he had so carefully orchestrated beginning to come to life. One can only but admire and learn from someone who has embraced such a formidable challenge, ALS, yet then lived the last part of their life to the fullest and in the most creative and engaging way that he did. He and his wife Margret faced their fate directly, and put a short term life plan into action with vigour and imagination. They lived a year of incredible adventures and have recorded it in detail and with insight in words and images for us all to read and live. Chrises life, his talents and general perseverance have been an inspiration to many. Chris planned his exit to the last detail, and on 4th of February 2007 (his birth date) his ashes will be scattered on Table Mountain in a spot he had chosen well over a year ago. 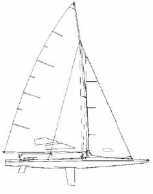 ... Because the South African sailing boat designer Jack Köper has reported to us about a small Scow designed by him, it seems to be interesting for our readers to publish drawings and a photo of this Tempo. Please, don't say now: "We already have enough racing classes in our country." Except for the question, one can discuss for certain, it is not the absolute intention of such a publication in a magazine to establish a new class. It seems for me to be important for our yachtsmen, to be informed about what someone else is doing in this field and if there were single ones, which want to build such a boat for themself, no man really goes overboard by this. Once, on the contrary, we really want to think here too conservatively if we assume that many yachtsmen think that the ranking list of their class is the only thing in the world. Whatsoever, the Tempo is a boat which, in our opinion, is worthwhile a closer consideration. 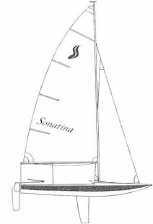 Besides, in reports which reached us about this Scow, among others in the magazine "South African Yachting", you cover that the Tempo does not only run at a stiff breeze but also is terribly fast in light weather. The bottom has a distinctive V-shape about the complete length. It is the secret of sailing with such a boat that it may not be sailed upright as it is usual at most other jolly boats but with a clear heeling, and by the windward side so coming out of the water the covered surface is reduced with a simultaneous prolongation of the waterline. The total weight of the boat (ready for sailing) is approximately 100 kg, light enough to guarantee an easily gliding. 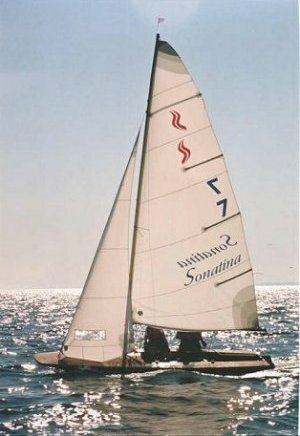 The Tempo is an exceptionally cheap boat which is suitable for the self making and with which a sporting yachtsman can have a lot of fun. Everything happened fast now: This article was a reason for many Dutch people to order the drawings from Mr Köper for self building. On October 30th, 1964 a group of Tempo enthusiasts founded in Haarlem a club, the Tempo Club Holland, to build together Tempos under the management of Freek Visser. Their names: J. Kol, F. Steekelenberg, B. and W. Steenkist, F. Visser, and T. van Wijkhuizen. The group got the drawings on November 8th. The drawings were first examined together with the chairman of the class organization, Mr. H. W. Sebregts. There were some questions concerning the minimum and maximum measures which were transmitted to Mr. Köper. On November 18th, the group found out that Mr. J. D. Schooneveldt from Aalsmeer (a well known FD boatbuilder) is just building a Tempo. They hope to be able to introduce this boat to all interested Tempo builders at their next meeting. The first Tempo is finally completed on December 7th. Mr. J. D. Schooneveldt from Aalsmeer has built a splendid boat and for everyone a new wealth of experiences is opened by this. According to the fact that something was still unclear in building plans and building instructions, there had to be waited for the first completed boat. In cooperation with the persons affected and the considerations of the boat builder, Mr. Vleugel from Amsterdam – a Tempo enthusiastic as well – made new drawings. Until now, those drawings should be substantial for all Tempos being built in Holland, to guarantee that all boats are equal. 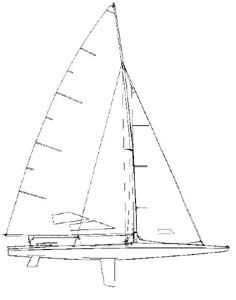 The difference between Köper's drawing and Vleugel's drawing is standing for two different class concepts: Köper's outline was intended as construction class where many measures are left open the boatbuilder – Vleugel's drawing, however, was for a one-design class with fundamentally less liberties for hull design and equipment. While there were many construction classes in South Africa at that time, in Europe only one-design classes had a chance to be appreciated. Perhaps this was another handicap, why Tempo hardly found further distribution. Finally also Köper understood this principle - the Sonnet, his last design - he designed against resistances as a one-design class in South Africa from the beginning and though found a good distribution. The great Tempo day was in Haarlem on December 19th, 1964. In the presence of Mr. and Mrs. Köper, Mr. Kazemir and Mr. Kuiper of the KNWV, those "men of the first hour" presented full of pride the first Tempo builded in Europe. In January 1965 class regulations were arranged in the presence of Mr. Köper. First German Tempo friends are starting with the building of polyester hulls in Essen in February 1965. Beloning to this, primary a wooden blank is built in agreement with the construction drawings to build a negative form of this in polyesther. The members of the Segel Club Scheppen in Essen found their way to this technique by their member Karl Ernst Bender who had a manufactory for processing synthetic material in Essen-Steele. The first race took place in Haarlem on Mooie Nel and Spaarne with 6 boats of the JVW on August 14th and 15th, 1965. The Essen Sailing Week followed on August 28th and 29th, where 18 boats, 9 Germans and 9 Dutchmen sailed to the start. The third race already counted 30 registrations, among that 7 Germans, again in Haarlem. Tempo was established in the Netherlands as a national class – in Germany as a one-type-class. By the end of the sixties hundreds of new Tempos were built in the Netherlands and in Germany. While in Holland Tempos were exclusively built in wood, the German boats were all built in polyester in the mould of Karl Ernst Bender in Essen. In two big building series a large Tempo fleet has been produced at the Segel Club Scheppen (SKS) and at the fire department sailing club at Lake Baldeney. Some of those self built boats also reached Tempo-enthusiastics at Lake Eder in the north of Hessian; Rudolf Büchsenschütz from Kassel was one of those Tempo yachtsmen. He addressed the WEGU rubber plants with the idea of a serial production of theTempo and other boats. And WEGU actually set up a little shipyard near Kassel. So the Tempo Scow became the heart of the WEGU boat-building at the end of the sixties. Rudolf Büchsenschütz was hired as a business leader (handyman). The Tempo fleet at Lake Eder grew to more than 20 boats and was at that time the largest class on this lake. At that time, Lake Eder yachtsmen were similarly active as their comrades from Lake Baldeney. WEGU built and sold hundreds of polyesther Tempos in the following period. Unfortunately, there was no cooperation with the class organization so that the buyers didn't receive any knowledge of races and class organization. Unfortunately, WEGU then stopped boat-building in the middle of the eighties. 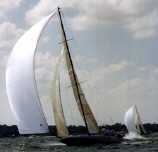 Large fleets met for races in the sixties and seventies in Holland and Germany. The regatta areas spread out over the whole Dutch-West German area: Sneeker Meer, Alkmaarder Meer, Mooie Nel/Spaarne (Haarlem), Westeinder Plassen, Vinkeveense Plassen, Spiegelplassen (Nederhorst den Berg), Kager Plassen, Brassemermeer, Wolderwijd (Harderwijk), Beulaker Wijde, Maas en Roer (Roermond), Lake Dümmer, Lake Baldeney (Essen), Lake Kemnade (Bochum), and Bever Dam (Hückeswagen). The starters in Dutch races were so many that the Dutch Championships were first opened for Germans too in the eighties. In the middle of the seventies racing yachtsmen in Holland and Germany agreed in one thing: our spinnaker is too small for sporty sailing. 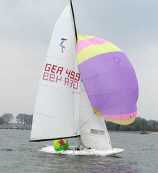 Several spinnakers of other classes were tried out and all agreed on the measures of the 470 spinnaker. In connection with the spinnaker some yachtsmen built a spinnaker tube into her boats, which has been proved very much on regatta sailing. Also well proved is an increased double bottom in the front cockpit area, strengthening the centreboard case and simultaneously reducing the water quantity that can reach the cockpit (when capsizing or cutting the waves too deep) so much, that the water has to be pumped out by the self bailers within shortest time and the boat does not lose too much impetus. There was an innovation in the Tempo boat-building in the middle of the eighties - Paul van der Sluis introduced a new style: A sandwich made of very thin triplex plywood and polyethylen foam stuck together with epoxy resin, frames made of marine plywood. For that technique, he built a new negative mould, optimized within the measures of the class regulations. German teams later used this mould to build epoxy boats, in a sandwich style as well, though with fibreglass instead of triplex plywood. Here a little new fleet of very robust, very stiff, light and fast boats was created. 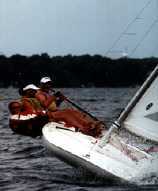 The eighties brought a strong radical change in dinghy sailing worldwide with the appearance of the windsurfers. Most of the people who would have usually been interested in a dinghy, chose the cheaper and less binding alternative windsurfer. At that time the "leisure society" appears the talk which decreased the interest in sailing with many new offers. To this day, all dinghy classes had and have to suffer from that, especially the little classes, such as the Tempo class. The result was a development which led to smaller and smaller starting groups because outgoing yachtsmen weren't replaced by successors any more. Meanwhile there are only two boats left in Holland, which can be seen occasionally on races. In the year 2000 the Tempo lost her class status in the Netherlands. After all, in Germany there are still so many boats that furthermore we can sail races, partly in the Netherlands and untill now we could hold our class status in Germany.